The Challenge Hydraulic Round Cornering machine was specifically manufactured for the high-production market. With a cutting capacity of up to 4 inches thick, this machine can power through almost any job, including both paper and plastic. This Challenge Round Cornering Machine accepts 6 sizes of cornering blades ranging from 1/8″ to 5/8″ radius. 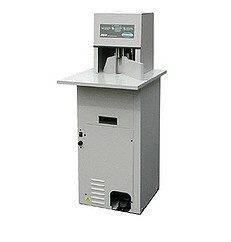 This machine includes one standard cutting unit of your choice with your purchase. If you have any questions or are interested in purchasing the Challenge Hydraulic Round Cornering Machine, visit us at SpiralBinding.com. We have great pricing on a full line of Round Cornering Machines. Call us at 1-800-631-3572 for more information!